We now interrupt all talk about birds and migration to consider dragonflies. And damselflies. Together they comprise Ondonata, an order of insects that, like birds, are beautiful in flight and challenging in identification. Unlike birds, they do not vocalize; unlike butterflies, they are totally predatory, not a vegetarian amongst them. When I was a kid, I thought the large darners that patrolled my camp lake would bite me (and, it turns out I was not totally wrong, some large dragonflies can nip when captured). When I started birding, I ignored them. And then, a few years ago in Colorado, I looked at a Pale Snaketail through my binoculars and became hooked by the absolute alien quality of the creature’s face juxtaposed against the beauty of its flight. 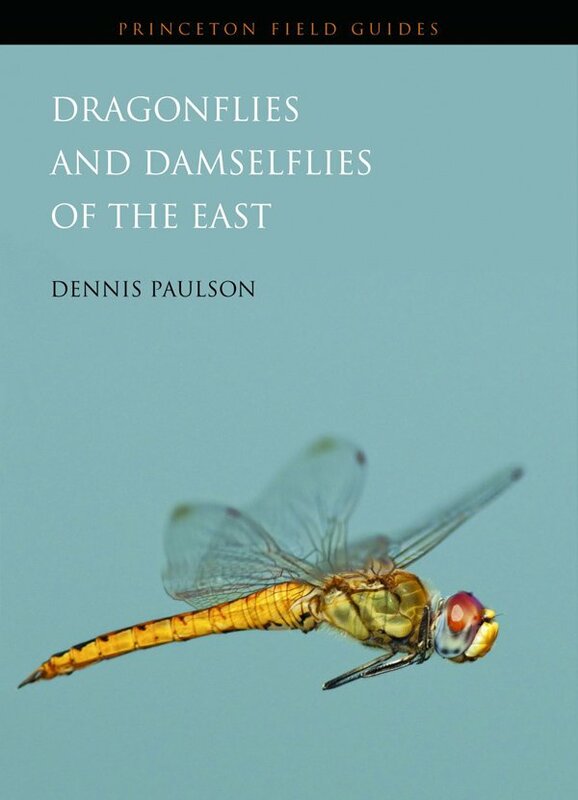 Like many odenate enthusiasts, I was excited when I heard that Dennis Paulson’s field guide, Dragonflies and Damselflies of the East, was finally being published by Princeton University Press. Dennis Paulson is a “real” zoologist; he received his Ph.D. from University of Miami in 1966 and has written over 75 scientific and popular papers and books, including Shorebirds of North America: The Photographic Guide. Director of the Slater Museum of Natural History at the University of Puget Sound for 15 years, he is now retired. Retirement apparently means writing this book and its companion volume, Dragonflies and Damselflies of the West (published by Princeton Univ. Press in 2009), active participation in the Dragonfly Society of the Americas and leading dragonfly trips to Costa Rica and, hopefully this summer, Panama. Dennis is also the “go to” guy for dragonfly and damselfly identification; the Internet is full of comments along the lines of “thanks to Dennis Paulson for identifying this mystifying creature”. I know from experience how accessible Dennis is, last year he helped me identify a damselfly I photographed in Costa Rica (Argia anceps, no common name). He is a naturalist dedicated to widening the circle of people interested in the natural history of odonates. Dragonflies and Damselflies of the East is the first comprehensive field guide to odonates in eastern North America. (Sidney Dunkle’s Dragonflies Through Binoculars, published in 2000, covers only dragonflies, not damselflies.) Although designed as a field guide, it is a hefty book, 376 pages long, covering 336 species. The specific geographic area covered is “east of the western boundaries of Ontario, Minnesota, Iowa, Missouri, Arkansas, and Louisiana”; the eastern United States and Canada is known for its diversity of odonates. 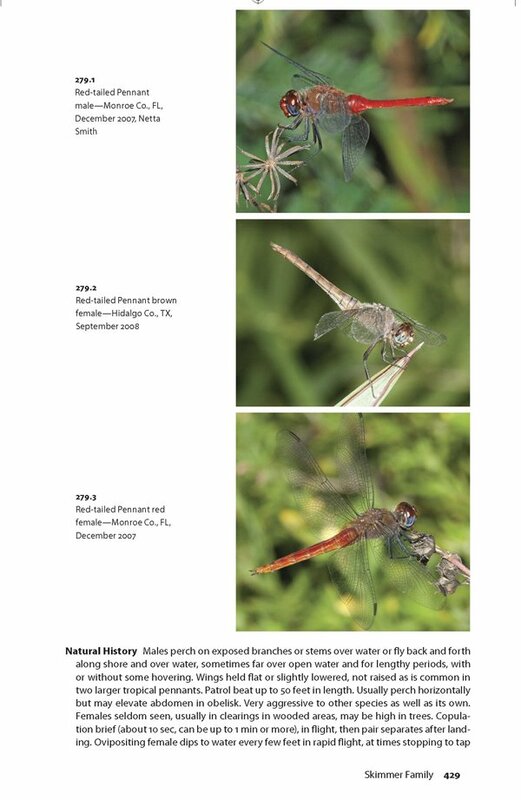 There is overlap with its companion field guide, Dragonflies and Damselflies of the West (the current total number of odonate species in North America is 462), and Paulson has made an effort to limit the amount of duplication, using different photographs for overlapping species and updating species accounts with new information. This is a significant book, and one that I have been enjoying using in the field and at home. I like the feel of the pages, I find what I’m looking for easily, and I relish the 675 color photographs of these beautiful insects. Each species account is about a page long and consists of a brief Description, Measurements, Identification Points, notes on Natural History, information on Habitat, Flight Season, and Distribution, a distribution map, and 2 to 3 photographs. The text is admirably concise and at the same time filled with detail. In some cases, the detail is almost overwhelming, and it is only in the field that you can appreciate how much each little point is needed. Many of the genus sections contain illustrations of anatomical bits, male appendages and, where necessary for in-hand identification, female tips or subgenital plates. The 350 illustrations are by Natalia von Ellenrieder and Rosser Garrison, the authors of a prize-winning dragonfly scientific manual. One of my few complaints about this book is that there is no listing or index for these illustrations. If I ever get to the point of expertise where I will need to consult them, I will be thumbing the pages of this book to rags looking for Striped Emerald female abdomen tips. The species accounts are preceded by brief introductory chapters that succinctly describe the life cycle of dragonflies and damselflies and explain their anatomical parts. This is necessary reading. 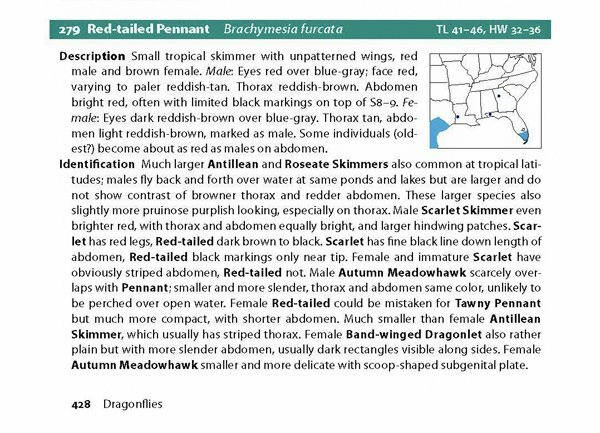 While it is possible to read a field guide on birds without knowing what undertail coverts are (I did it for three years), it is very hard to follow a dragonfly field guide if you don’t know a thorax from an abdomen. (The abdomen is the part of the body you may think of as the tail; the thorax is the middle section.) Paulson does keep technical terms to a minimum, this is not a technical manual, and he makes effective use of drawings and photographic close-ups to illustrate terms as we read. There is a glossary in the Appendix, which translates terms like teneral (freshly molted adult) and exuvia (discarded skin from larval molt) into common language. 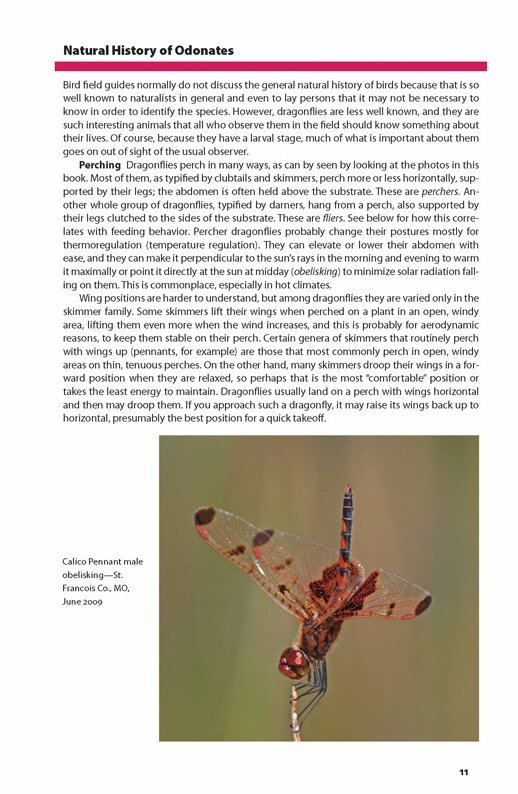 The introductory section also covers odonate colors, names, threats and conservation, research, how to photograph dragonflies, how to collect them, and, most importantly for us beginners, how to observe dragonflies and damselflies for identification. It is very readable material, partly because of Paulson’s easy writing style, and partly because Paulson never condescends. In fact, he invites us to join him in researching and writing about odonates, emphasizing that this is a young field in which contributions by amateurs have been valued just as much as contributions by professionals. In addition to the Glossary, the Appendix includes a basic list of Dragonfly Publications and Resources, including regional field guides, listservs, organizations, web sites, and sources for collecting gear. (Book nitpicks: I hope that subsequent editions will include John Abbott’s excellent Damselflies of Texas: A Field Guide, published in 2011, and the most recent edition of Blair Nikula’s A Field Guide to the Dragonflies and Damselflies of Massachusetts, 2007.) A longer reference list that includes scientific articles can be downloaded from the Princeton University Press web site. The Index is much improved over the 2009 western book, with larger type and an expansion of how names are listed. I was able to find Red-tailed Pennant under “Red-tailed”, “Pennant”, and “Brachymesia”. This probably sounds nitpicky. It won’t be when you are looking for that dragonfly that you think is a clubtail, but for the life of you, you can’t remember the exact name. The main drawbacks of Dragonflies and Damselflies of the East are really a consequence of its superb qualities. If you’re going to publish a comprehensive field guide of 336 species made of excellent quality paper, you are going to get a heavy book. This one is 2.5 pounds. I imagine length and weight are also the reason the species accounts are sequential; one following right after the other, as opposed to one species per page. This initially bothered me, but I found it to be of little consequence once I started using the guide in the field. If you’ve birded the eastern United States, you’ve probably seen this dragonfly. It’s a Halloween Pennant, and it can usually be found perching on grasses at open lakes and marshes. 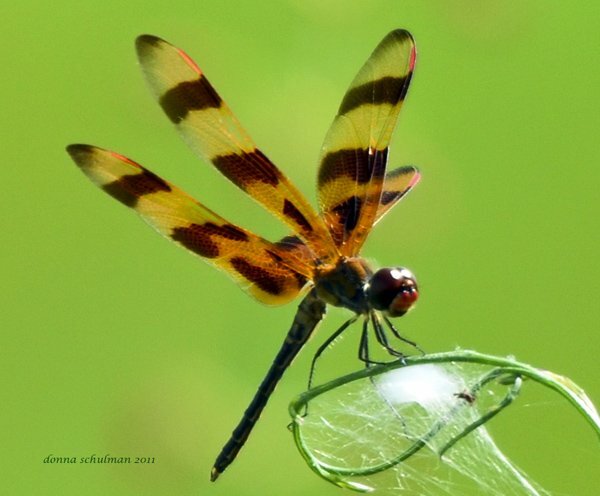 And, if you recognize this dragonfly, then you will probably want to purchase Dragonflies and Damselflies of the East. Because as birders we can’t help looking at the whole picture, and once we start looking, we want to identify, give those flying things names. This is an excellent landmark field guide that belongs in every naturalist’s collection. I do suggest that if you have not bought a book about odonates before, you consider buying a regional guide as well. They will give you details of local flight patterns, as Paulson points out, and they will narrow the field, giving you a good idea what odonates you are most likely observing when it’s midday and the birds have disappeared. I’m going to name a few of the guides that I have found very helpful, and more titles can be found in this book’s Appendix. If you live in the northeast United States, take a look at Ed Lam’s Damselflies of the Northeast: A Guide to the Species of Eastern Canada & the Northeastern United States, a beautiful book featuring Ed’s incredible illustrations. 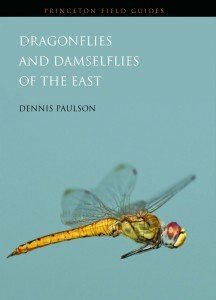 I’ve found Giff Beaton’s Dragonflies and Damselflies of Georgia and the Southeast very useful whenever I travel south. John Abbott, author of the previously mentioned damselflies of Texas guide, has also written Dragonflies and Damselflies of Texas and the South-Central United States. For Massachusetts, there is A Field Guide to the Dragonflies and Damselflies of Massachusetts, 2nd edition . And, Kathy Biggs has just self-published Dragonflies of California and the Greater Southwest: A Beginner’s Guide in a Kindle edition. Odonate enthusiasts, what regional guides have I left out? And, what is your opinion of Dragonflies and Damselflies of the East? And, while we’re at it, what is the best dragonfly or damselfly you have ever seen? You don’t have to know the name, just describe it. If you’ve never tried to identify dragonflies or damselflies, take advantage of this wave of excellent field guides and start looking and photographing and identifying them. You’ll find them patrolling the fields and basking on stones in the river; swarming high in the tree canopy at dusk and copulating in heart wheels over the water at noon. Dragonflies and Damselflies of the East (Princeton Field Guides). 576 pp., 675 color photos. 350 line illus. 333 maps. size: 5 1/2 x 8 1/2, 2.5 lbs. All photographs, except the photo by the blog author, are used with the permission of Princeton University Press. My amateur identification of the red dragonfly has been corrected. It is an Antillean Skimmer! Ed Lam’s comments, as posted on Facebook, are reprinted below. This shows two things: (1) Dragonfly identification is Really Challenging, (2) In addition to a good field guide, it is really helpful to be part of a network of dragonfly friends. 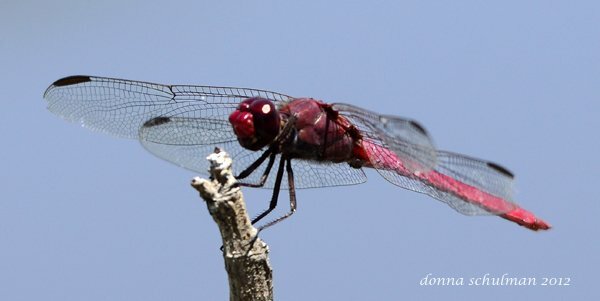 The red dragonfly is a male Antillean Skimmer. Comparing males, the thorax of Red-tailed Pennant is a yellow-brown and shows more contrast to the red of the abdomen. The thorax is purple-red in Antillean. The bottom of the eyes are blue/gray in Red-tailed Pennant, red-purple in Antillean. Red-tailed Pennant has a small amber patch at the base of the hind wing, missing in Antillean. The face of Red-tailed is paler red fading to cream, not the more uniform deep red of Antillean. Antilleans are larger but scale is very tricky without direct comparison and while wing posture can be a clue, I wouldn’t use it as a field mark. Excellent and very comprehensive review, Donna. This book sounds like a needed additional resource for anyone interested in odes. 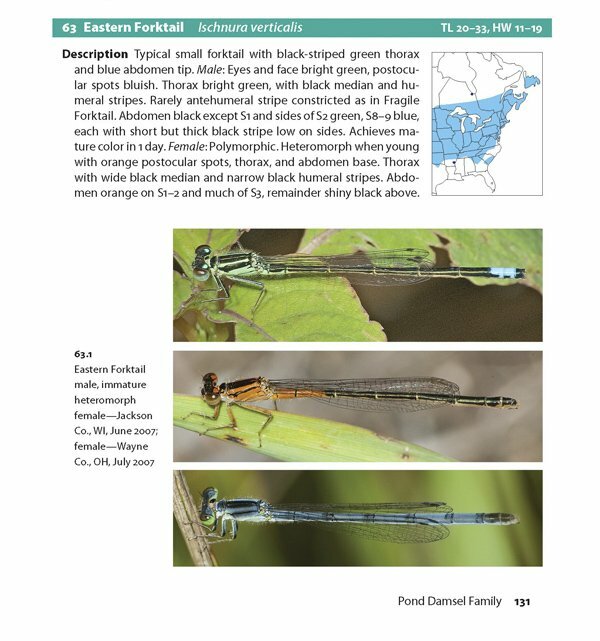 Since one cannot have too may field guides, especially as some IDs are complex and confusing at best, may I also suggest Ed Lam’s Damselflies of the Northeast. Also comprehensive, clear and beautifully illustrated. These two books should work well together when looking for these beautiful insects. In an entire weekend of odonate collecting, photographing, and identifying the last of April, Dennis’s new book was the ONLY one we took with us, despite having a dozen or more field guides on the shelf. He’s really outdone himself with this volume. The extra weight of the book is easily offset by all the others you DON’T have to carry along. The eastern volume seems to me an improvement over his earlier western book–a much easier read, more comprehensive descriptions, and one or two “never-fail” (or ALMOST never-fail) characteristics for each species. If you could only have ONE odonate guide……..THIS is it! P.S. Dennis truly is the go-to guy for odonate ID. He’s always ready to help out a rookie. @Rich – Thanks! I agree, my car library will be carrying Dennis Paulson’s field guide and Ed Lam’s Damselflies of the NE this summer. @George – There’s nothing like real field experience to tell you if a field guide is worth the money. Thanks for verifying my excellent opinion of this book and Mr. Paulson. Wonderful review! Great Book! Thanks for mention of my new eGuide!! You ask what guides you may have left out – well,this isn’t a guide, but a lovely tabletop book with lots of LARGE dragonfly scans and pictures and even a section for building a pond for Dragonflies: A Dazzle of Dragonflies by Forrest Mitchell and James Lasswell. Great comprehensive review! You just confirmed my love for this book. As far as other regional guides- For the west, Kathy Biggs’ book you alredy mentioned, I also use Paulson’s Western Book, and Dragonflies and Damselflies of Oregon by Kerst and Gordon works well even in northern California (only missing a few species for no. CA). Thank you for the suggestions, Dragonista. More and more, I find I am using the regional guides in conjunction with Paulson’s. I do need to purchase the Oregon guide, in anticipation of a trip out west at some time in the near or far future! For the Midwest, “Dragonflies of Indiana” by James Curry is excellent. Thank you for posting this in-depth review. I am considering buying this book, and the information you provided is very helpful. Glad the review was helpful, Ray. I do own the North Woods guide. I like the whole series. I’ll look into the Northeast Ohio guide. I find local guides fascinating, even if I’m not going to go to that area! Where Are You Birding This First Weekend of May 2012? Where Are You Birding This Second Weekend of May 2016?